This roasted duck recipe is so delicious that it is rabble rousing. People will flock the streets just to taste it! It is slow roasted, which makes it extremely moist inside and crispy outside! Have you roasted duck before? If not, you don’t know what you are missing!! Before I started roasting duck, I used to think it was hard. But it isn’t! And I figured out that the best way to roast duck is to slow roast it because that keeps the meat so moist. When I was growing up, we used to have a big meal on New Year’s day! What about you? Do you, or did you have a big meal to celebrate the ringing in of the New Year like we did? Now, since it is only Christopher and myself, we don’t usually make big meals for just the two of us. But this year, I wanted to do something different. And since we hadn’t had duck in a while, I decided to make this fabulous meal! Get out a large roasting pan, a skewer and preheat the oven to 325 degrees Fahrenheit. Place the pan into the oven and set the timer for an hour. Once it’s done, I open the cavity and take out the orange wedges and garlic and throw them away. Look at how crispy the roasted duck’s skin is!! And the steam coming off of it. I let the roasted duck rest for 15 minutes before cutting it up. I gather the rest of our meal and plate the duck with some potatoes and roasted carrots. I pour some sauce on the meat! See how yummy that looks?! Mmmm. It was so delicious! I hope you enjoyed this roasted duck recipe! Please feel free to leave me a comment. Do you slow roast your duck or roast it faster? 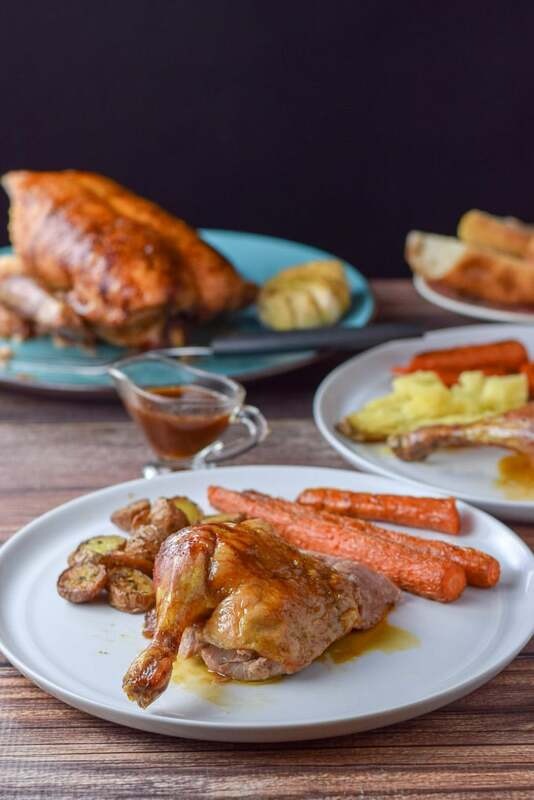 If you’ve tried this roasted duck or any other recipe on the blog, I’d love the hear what you thought about it in the comments below. I love hearing from you! You can also FOLLOW ME on FACEBOOK, TWITTER, INSTAGRAM and PINTEREST to see more of my delicious food and delightful cocktails! 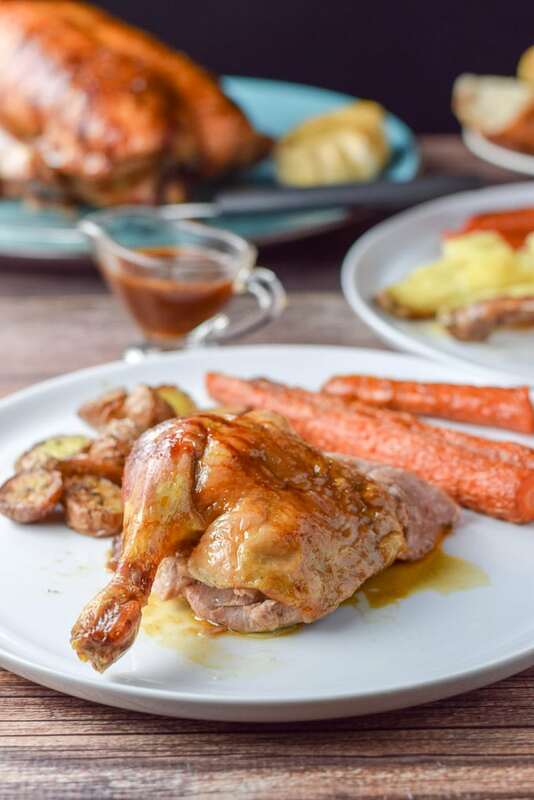 This roasted duck recipe is so moist and delicious!! When you cut into the skin, be careful not to cut into the meat. Also use something like wooden spoons to flip the duck as you do not want to pierce the meat with metal implements because it would dry the meat out! My uncle used to hunt ducks when I was a kid and that was the only time I ever tried them. I’m a vegetarian now, but you can bet that I will find something to put the sauce on to! It sounds amazing! Hehe. Thanks Kate! It’s a great sauce! I make it quite a bit! Thank you for the complete step by step on this. I’ve been wanting to try roasting a duck, but have been a little intimidated. Great post! Thanks Teri, it’s surprisingly easy! I love duck, and the flavours you have going on here are amazing! Slow roasting is the way to go for sure! Will be adding this to my Sunday dinner menu! Oooh that sauce has me swooning. I love the thought of adding a cheeky bit of Cointreau to it! Hehe Katherine! I love the sauce! 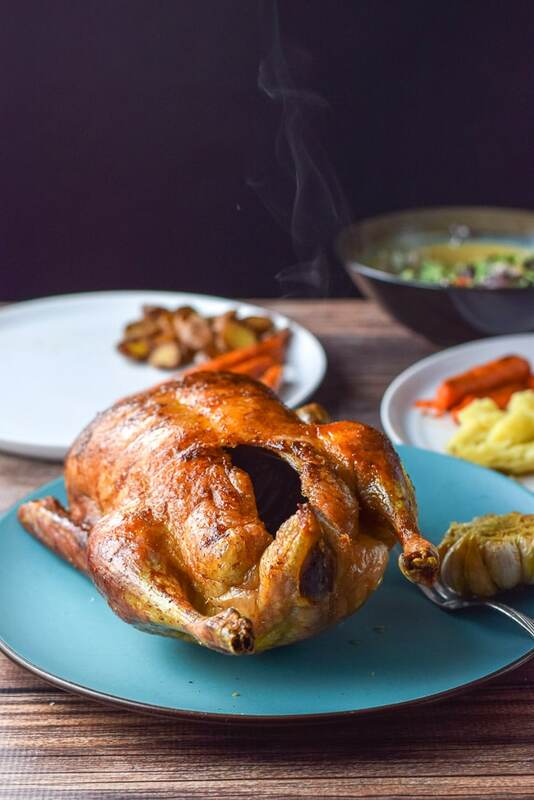 I roast a whole chicken several times a month and I’ve always wanted to try duck, but I was so scared of screwing it up. This is the perfect tutorial – lots of little tricks I wouldn’t have known. Thank you! Thanks so much Danielle! It is super easy! Love the name of this recipe! It is perfect for the rustic presentation with the roasted carrots and potatoes. You know, whenever I go out to dinner, if duck is on the menu, that is what I order. I am finally getting hubby to try it….I know I will eventually get him to like it. This looks amazing and so tasty. I am all for more duck recipes! This one looks amazing Elaine! I haven’t eaten duck meat in ages. I love all the citrus notes in this one. I completely agree with tossing the oranges, but I was thinking that those garlic cloves that were steaming inside of the duck would taste delicious squeezed onto some crusty bread. This recipe looks so good, and I really love the flavors in your glaze. I’m definitely picking up a duck the next time I go to the store. Thanks Patti!! Long ago, I did taste the garlic from the cavity and found it absorbed the salt, which is why I toss it. But yes, garlic on crusty bread is the best!! I hope you enjoy it when you make it! Oh my gosh! It’s been way too long since I’ve roasted a duck! That skin looks amazing! I also love keeping the fat for roasted potatoes later! Yum! Me too Pam! Thank you for your comment! Thanks Catherine! I appreciate that! This duck recipe looks absolutely juicy and yummy! A bit of inspiration to take a little more time to prepare that special family meal. Thanks! Thanks so much! It seems to make a difference slow roasting it. I used to roast it in less time and I prefer it this way! I’m drooling just looking at your pictures Lainey, we love duck and I always slow roast it too but your sauce looks so good, I absolutely must make it next time! Beautiful photos and styling, the lighting is exquisite, it fits the dish very well. What a great meal to severe at a fancy dinner with friends! Thank you Tara! I appreciate everything you said! Your slow roasted duck recipe has me drooling. The citrus and maple syrup glaze really makes this a unique and one of a kind dish. Thanks so much Sharon!! I appreciate it! You clever girl, Cointreau with duck! You couldn’t have found a more attractive combination than this. This is St Valentine fall in love again. You explained it so beautifully that I am now going to buy my duck and a bottle of Cointreau. I think duck is so undervalued here in our culture where is seems chicken is most prevalent. Where my daughter lives in Hanoi it is everywhere. Duck is roasted on the street and in most markets. I can’t wait to try this with that sauce! Thanks so much Analida! I agree, I may actually prefer it over chicken, but it’s harder to find year round where I live. I’ve never roasted duck at home before. Love that you used Cointreau with this – such a good flavor combo! You’ve convinced me — I have to make duck. It’s just the two of us, just like you, but I know we’d enjoy it. I remember we had it years and years ago and it was delicious. Every time I mention duck to Hubby he turns up his nose and says it’s too greasy. I don’t know where he got all the experience. The last time he had duck was at the same time I did and we both loved it. Men can be stubborn. I’ll just go shopping without him and get one. Yours looks delicious. Haha Marisa, that’s so funny! It must be a memory for him because I think that’s what most people think when they think of duck! (I used think in that sentence 3 times.) That’s why you poke the skin to let all that fat dribble out!! I saved the breasts and made a curry which I’ll be blogging about real soon! My mouth is watering! Our New Year’s tradition growing up was “cannibal sandwiches” (steak tartar). I loved them! I love duck, and this looks like a really nice way to cook it. Thanks for sharing! Tamara! How fun! I love the name of the sandwiches. And I love steak tartar! Thank you for your comment! Thanks Veronika! I hope you enjoy it when you do! This duck is SO succulent and flavorful. It also gives me a nostalgic feeling for the good times and meals we had at Wakefield’s Duck Walk restaurant when it was in business. I miss that place! You’re a champion for cooking duck.